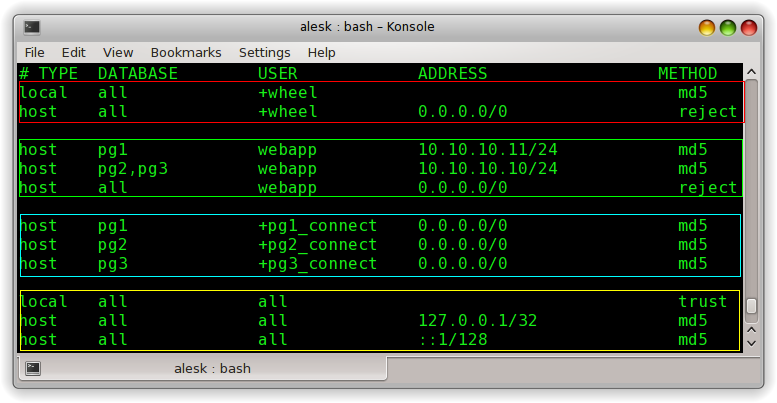 ← Reading ServersCheck Status page from command line – Part 3. No doubt that PostgreSQL (PG) privilege system is very flexible one but at the same time, due to the architectural differences between PG and Oracle, it is also substantially different from patterns used in Oracle. Considering myself as a total PostgreSQL newbie, I thought it would be a good start for me to write down some basic PG security approaches (patterns?) in a form of a blog article. Of course, since I’m a PG newbie, don’t take anything you read here for granted and please, don’t blindly follow my recommendations without trying this on your own — I’m sure some things could be done differently, more efficient or more secure. If you think I’m dead wrong on something I said here, please contact us and I’ll certainly correct the content with proper attribution. Here is a business scenario that I’ll be referencing during this short “how-to” tutorial. Acme Ltd. was an Oracle customer for many years. Recent economic downturn caused a serious cut in yearly IT budged expenses. Top management decided to deploy all newly build applications on open and free software stack. PostgreSQL was first and only choice for database layer by DBA team, developers where less enthusiastic, so they asked DBA team to prepare some proof of concept working environment, where they can try out PG features and test security framework. We think that default PG privileges are unreasonably generous on public schema. Schemas are perfectly suitable to achieve this goal. In each database we created three schemas, ACME (core application), ACMEREP (reporting), ACMELOAD (ETL stuff). Note that we deliberately specified postgres superuser as schema owner – for now – we’ll change this later on. We also created single demo table in each schema, solely for testing purposes. In PG we have two kind of roles, login and nologin roles. 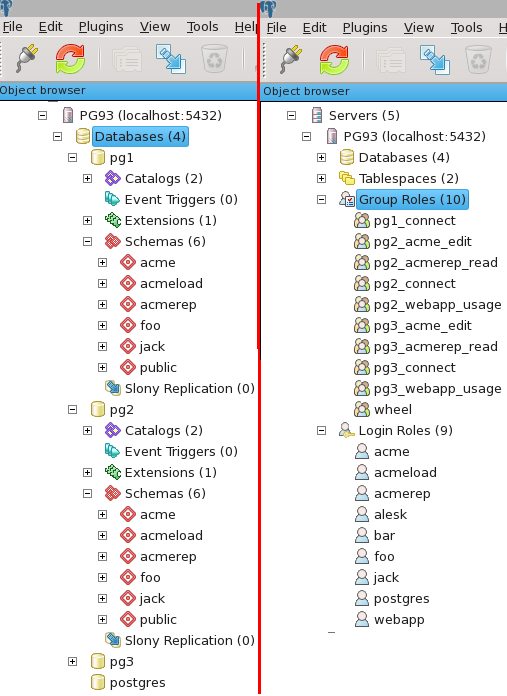 Roles are global across PG cluster and thus shared by all databases in the cluster. Think about login roles as being users and nologin roles as being groups. With users we try to identify people (and/or applications) accessing our database and with groups we share permissions between people. It was not always like that, in PG versions before 8.1 there were two strictly separated entities; USER and GROUP, that’s why some old statements still work in PG 9.x, but it’s better to stick with the new terminology and syntax. In this section we’ll create both kind of roles. Before PG allows user to connect to the database it checks pg_hba.conf file if there is a rule that approves user connection or not. PG is always processing rules in pg_hba.conf from top to bottom, the moment it finds satisfying rule it stops. So, it’s very important to carefully edit this file, because you can easily open the door to someone you don’t want to. When I first read about the concept behind pg_hba.conf I said, ok, it’s a simple and flexible way of controlling who can access the databases in PG cluster, but at the same time it’s also cumbersome and error prone to rely on DBA to properly edit configuration file for each new user account. There must be a better way and hopefully there is — we can manage connections to PG with standard permissions on database (granting “connect” role), pretty much like we’re used on Oracle. For each database (pg1, pg2, pg3) create “special” group role that will control who can connect to particular database. We’ll add these roles to pg_hba.conf later on. Now we should edit pg_hba.conf. Personally, I want to edit this file just once per database, not once for each user. Ideally, this file should not contain any users (login roles) at all, but we’ll make an exception when creating rule for webapp login and this is fine. As in Oracle I would like to administer rights to connect to the database exclusively from psql, granting/revoking “connect” role. The plus sign in front of pg1_connect role is the crucial trick that I was not familiar with until I read blog post by Shaun Thomas . It means that rule will match *any* role that is *directly* OR *indirectly* member of this role. Without + the rule would match only that specific role. Now, we need to create some login roles for developers. We decided that we’ll keep Oracle kind of schema pattern, where application is installed in dedicated application schema. Developers who work together will also share same login role that’ll give them access to particular schema. Note that by default we allowed developers to connect to development and test database by granting them both connect roles (pg1_connect, pg2_connect). Developers are not allowed to connect to production database pg3. So far so good, but there are still things to configure. We need to create dba account that’ll have enough privileges to manage all three databases at database level. Web application will also need special (limited) account with privileges on acme and acmerep schemas on PG2 and PG3 databases. Access from application server should be restricted to specific IP’s. Another thing that needs to be done is limiting superusers connectivity. In production environment it’s a crucial protection step to disallow superuser’s to connect to PG cluster over the network — if superuser needs to do something on PG cluster she/he must first connect to server either with ssh or locally. Let’s begin with application “dba” login role. We have user Jack who is responsible for managing databases pg1-pg3. -- by granting him roles that're owners of those schema's! to Jack, thus allowing him to manage all objects that’ll be created by developers in application schemas using those three login roles. He can not create new databases and/or roles – these privileges remain in the domain of superusers. Finally, he has his own schema to keep his own objects away from the others. At this point webapp user has been granted roles with necessary privileges on objects in both schema’s, acme and acmerep. For now it’s just a single table, but additional privileges will be granted to edit/read roles by developers later. However, before webapp login role can access data in both schemas it needs one additional privilege: USAGE on both schema’s. We decided to create separate role just for this privilege. This’ll allows us to easily remove access to all objects in application schema’s with single revoke statement. Last but not least, we want to control from which IP’s can webapp user connect to the database. At the same time, we’ll configure pg_hba.conf in a way that’ll prevent superusers to connect to PG cluster from network. Let’s start with the superuser. We’ll use the same trick as before, combining PG role with (+) entry in the pg_hba.conf. Connect to PG cluster with superuser and create special role wheel. Securing connection by webapp user is done in a similar way, with the help from pg_hba.conf. We’re allowing connection to pg2,pg3 databases with user webapp only from 10.10.10.10/24. Webapp can also connect to pg1 from 10.10.10.11 which is application server dedicated to development. From all other IP’s connection attempts will be rejected. Content of pg_hba.conf file on my laptop is shown in the following picture, where I grouped together different sections. Note that the line using “trust” is there only for my own convenience when playing with PG on my laptop. This line should be removed from config file on production PG cluster! We have three separate databases for development, test and production with restricted permissions on schema public. In each database we created three schema’s dedicated to application. Each application schema is owned by login role with the same name. This login role is shared by all developers working on that particular module/schema. Application DBA for AcmeApp has rights on all three application schema’s, but otherwise lacks any superuser rights. Oracle variant of DBA (SYSDBA) is reserved for superusers. Superusers can’t work over the network, they can login locally only. We’re managing rights to connect to the particular database with database “connect” roles, rather than by tweaking pg_hba.conf for each user. Web application server can connect to PG cluster from restricted IP’s only. Posted on 11.11.2013, in Linux, PostgreSQL, etc. and tagged PostgreSQL. Bookmark the permalink. Comments Off on Securing PostgreSQL.